Souvenir shopping while on vacation was one of my favourite things to do! Who wouldn’t want to shop around local markets and bring home a collectible item from a foreign country visited? As a global travel blogger, I’ve purchased bright Bolivian blankets and throws, colourful silk scarves from Cambodia, cute elephant shaped magnets from Thailand, handmade bookmarks from Vietnam, paprika spices from Hungary, lacquered dishes from Malaysia, carved wooden spatulas from Cuba, Swarovski crystal figurines from Austria, yerba mate from Argentina, raw cacao beans from Panama, and chocolates from most places visited in Europe. Over the years, however, the travel souvenirs I have collected became quite impractical and ultimately just took up space in my apartment, piling up with other ‘junk’ hiding in cupboards. I’ve had quite a few ‘in the moment’ purchases (like Fair Trade Cacao Beans from the Oreba Organic Cacoa Farm in Panama) but ultimately, chocolates get eaten, magnets break, jewelry and accessories go out of style, shotglasses pile up in a cupboard, and local figurines get covered in a layer of dust. As I traveled more frequently, I realized that the typical junky, imported “Made in China” magnets or thimbles, with the city’s name on it, aren’t really practical nor authentic souvenirs. 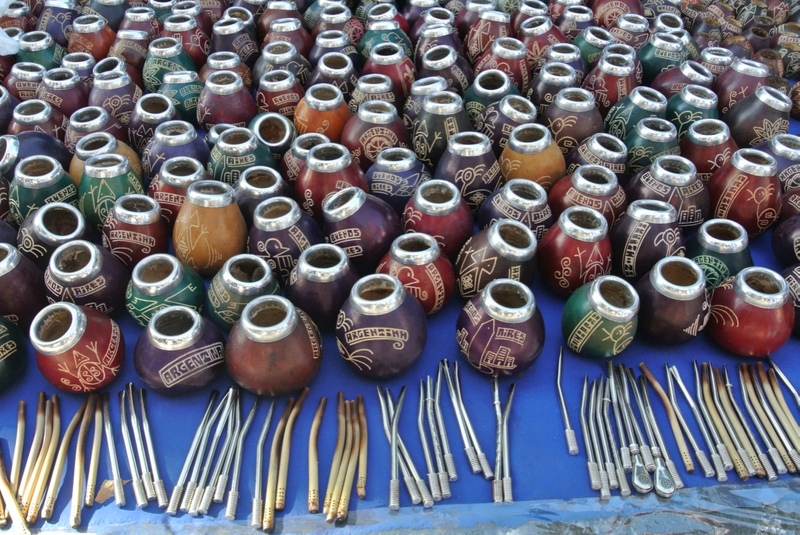 Yerba Mate Cups For Sale at at Market in Buenos Aires. Seems cool to buy in the moment, but what will you do with it when you get home?! The BEST travel souvenir to take home from any country, in my opinion, is a simple postcard. But not just any postcard….it’s a postcard that you write while travelling and mail home to yourself. Postcards are something you can find in any city or country you are visiting. They are cheap, often costing only pennies, and a stamp, a few dollars or less. 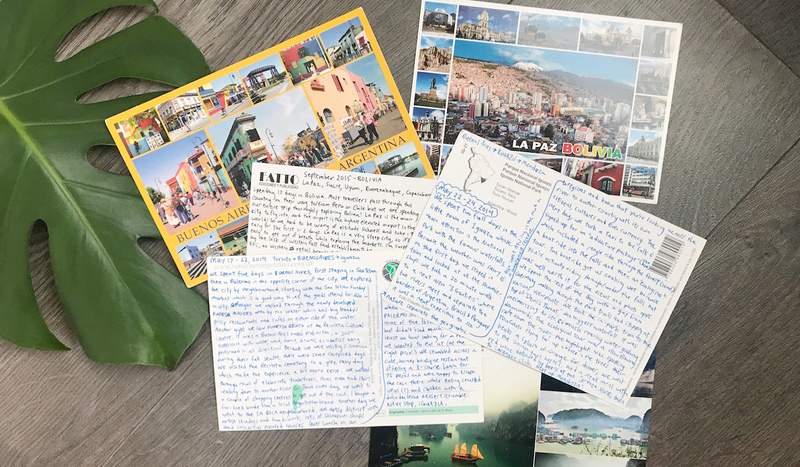 It’s a visual reminder of a place you have been, but what makes it the most special, are the memories you capture as you write a letter to yourself. Write the postcard to yourself while your memories are still fresh. Write about what did on your trip, what you saw in each city, and your favourite sights and activities. Write about how you’re feeling in the moment, or the inspiration that comes from travelling. Write while you’re still in the city the postcard is from. I like to write at airports or in transit; basically any place where you’re just waiting around and have a pen and a flat surface. Or write at a restaurant or cafe, when you and your travel partner have nothing left to say to each other and you would both otherwise just be using free wi-fi and looking on your phones. When I flew with Austrian Airlines back in 2009, their in-flight meal actually came with a tear-off postcard. So you could write on your flight, and they would even send the postcard for you, anywhere in the world, for free! As you are sending your souvenir to yourself, you don’t have to carry it around for the rest of your trip. When you get back home, the postcards barely take up any space – you can easily store in an envelope or a recipe card box. As a bonus, you also get a stamp of the country you were in. If the intention of collecting a souvenir is supposed to be a unique memory of your travels, what better than a postcard to yourself? It is such an awesome idea! This is such a genius idea. When I was in Spain back in May, my aunt sent postcards home to her grandsons and I wish I had been creative enough to think to send some to myself. Instead I just bought them and they are blank. I am going to use this moving forward! wow this is a great idea! i’ve always mailed postcards to friends and family who i couldn’t really get souvenirs for and as a reminder that i’m thinking of them but never thought to write them to myself! thanks for sharing!! Omg this is such a good idea!! I have always (sporadically) bought postcards or sent them home but I love the idea of writing to yourself about what you’re up to do you can remember it. I’m so gonna do this! This is lovely, and I can’t believe I’ve never thought of this. Will start doing this on my next trip!!! My mom used to make me do this as a kid and I recommend the idea all the time! I lovvve this idea! Souvenirs started taking up way too much space, though I love getting clothing that I’ll actually use. I even send my gramma a post card from everywhere I go and when I visit her I can read them all back! I love this idea! I, too, am guilty of collecting too many souvenirs but this idea is a fantastic way to avoid that and hold onto those memories!